When using an anvil, no sound is played when you complete the task. This used to be a multiplayer client-side only bug, but affects the host as well since the 1.1. * beta. I've noticed a bug when connected as a multiplayer client, that certain sounds don't work, a horse or when using an anvil, for example. Using an anvil, combine a book with a tool, no sound is played when you complete the action. 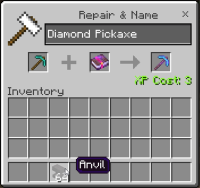 MCPE-12004 Block Entities renamed from an anvil don't keep their name when placed and broken.